With Snapchat’s August 2014 valuation of over 10 billion USD, seasoned investors and people who like to shoot their mouths off for no good reason alike have suggested the relative newcomer might very well be the one to overthrow the decade-old social media monolith, Facebook. But are such predictions fair? After all, Google + never did take off the way we all thought it would (add us there, anyway), and Google had and still has more resources to commit than either Facebook or Snapchat. 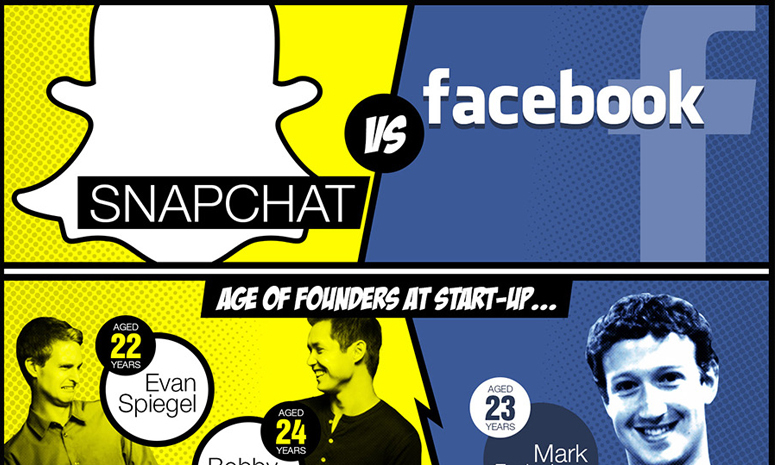 And Snapchat doesn’t overlap with Facebook as much so it won’t actually be competing… or does it? DPFOC.com sent us this infographic that seeks to answer this and other questions on just how similar the two social media giants are – and if you should be calling your fund manager to check into it. It’s doubtful Snapchat will overtake Facebook that soon if it can’t offer a good enough incentive for users to switch over. Google + was and is demonstrably better in many ways than Facebook, but it’s just way too much of a hassle for users to switch to a whole different platform if they are already too used to the one they’re using. The most foreseeable way Snapchat could be a real threat to Facebook is if Facebook messed up in some way that really displeased the core users. A similar situation happened during the infamous Digg-to-Reddit migration. Post-millennials are jumping ship from Facebook to Snapchat. While they do represent a lot of buying power, it won’t compare to what older generations have, at least not for a couple of years. Never mind both online apps require users aged 13-17 to have parental consent to join, and explicitly bar younger users. The reality of course, is very different. A group of Princeton Researchers claims that Facebook would likely lose 80% of its user base by 2017 (Epidemiological modeling of online social network dynamics; John Cannarella, Joshua A. Spechler1,∗ 1 Department of Mechanical and Aerospace Engineering, Princeton University, Princeton, NJ, USA ∗ E-mail: Corresponding spechler@princeton.edu). Fact is, very few users with personal accounts care all that much about privacy. Otherwise they wouldn’t be on social media in the first place. As Snapchat grows and matures with its young market, so too would opportunities to make money off of the platform. What do you think about Facebook and Snapchat? Comment below!